SLCCO Outdoor Beach & Picnic Blanket - Waterproof & Sand Proof Red Mat - Foldable Compact Quick Dry & Ultralight - For Camping & Backpack - Mini Portable Travel Ground Cover Tarp 55"x72"
Wish you didn't have to lug a heavy bulky blanket to the beach or wanted something handy and lightweight to protect your children from the dirty ground? We have the solution! SLCCO Outdoors Mini Picnic Pocket Beach Blanket is what you really need! This sand proof ultra cool ultralight blanket beach works either inside, outside or in any emergency! Extremely convenient and portable, the tiny 8.5” x 6” little bag unfolds into a huge 55 ” x 72” mat, large enough for a family of 4. This all season tarp is washable and quick dry, also water repellent and puncture resistant. The carabiner makes it easy to attach to your backpack, your bicycle or waist belt. Super light, makes it easy to be used as a sun or rain canopy as well as an oversized table cloth. Handy and durable to protect your child from the wet lawn or just when moms need a helping hand at nap time. 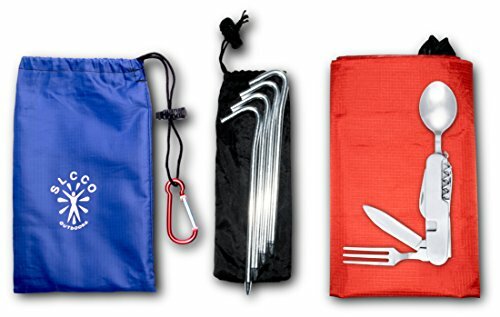 This tiny baggie includes 4 big pockets for your small belongings plus 4 long metal anchors for extra weighted support. At the campground, while hiking, relaxing at the beach, concerts, festivals, ballgames and romantic picnics. Compact enough to keep in your purse or glove compartment of your car. It comes with a FREE 6:1 PICNIC TOOL. GREAT GIFT IDEA! 100% CUSTOMER SATISFACTION GUARANTEED: Our premium SLCCO Outdoors mini blanket comes with our manufacturer 30 day money back guarantee, so if you're not satisfied with our product, please contact our customer support team for a replacement or refund. Click the "ADD TO CART” button now and get your SLCCO Outdoors mini blanket plus your FREE GIFT. We'll ship it immediately! View More In Sleeping Bags & Camp Bedding. If you have any questions about this product by SLCCO, contact us by completing and submitting the form below. If you are looking for a specif part number, please include it with your message.